Tea books abound, as fellow blogger William I. Lengeman III has shown on this blog in his monthly postings about the latest of them. And I have learned to “just say no” when it comes to offers to review new ones. I would be spending time on nothing else. However, a little book called Tea Wisdom by Aaron Fisher from Tuttle Publishing was too enticing to give the brush off. 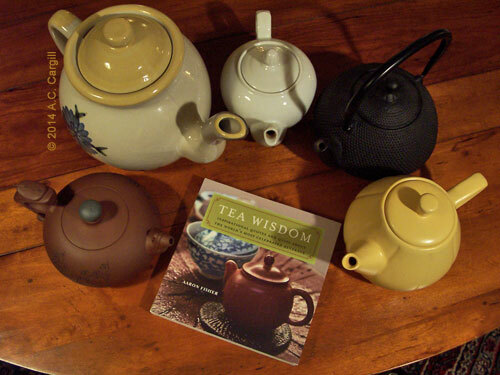 Tea Wisdom is a small book with beautiful photos, larger print (but not huge), and a wealth of wisdom about tea. It is perfect for a tea moment of just you, a cuppa, and the wisdom of the ages. The author has traveled in many of the world’s best tea producing areas and now resides in Taiwan, famous for its oolongs (try the Formosa oolong sometime – heaven!). Small wonder the teapots were drawn to it like moths to a light!